Vapor Blasting Abrasive & Media | Gonneville Inc.
A coating is only as good as the preparation of the underlying surface. Professional wet abrasive blasters know that choosing the right abrasive is key to achieving a coating application that lasts. With the right abrasive, you’ll maximize profits by getting the job done faster while expending the minimum of abrasive. 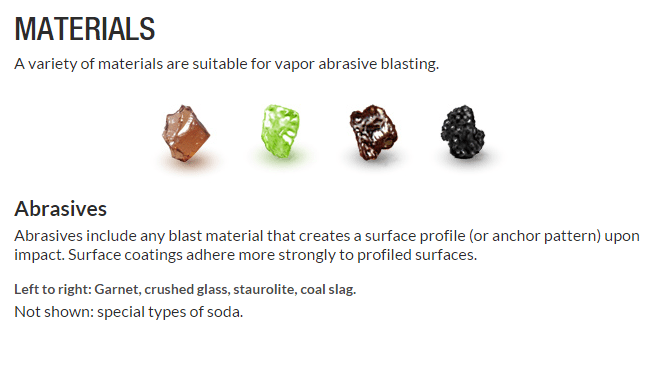 As a general rule, the blaster should use the finest abrasive necessary to attain the required surface preparation characteristics. 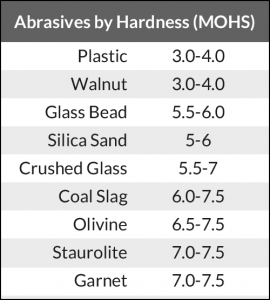 A fine abrasive will give you more impacts per volume. The more particles in the stream, the more work is accomplished in the same time. When blasting concrete or wood, you don’t need a hard, expensive abrasive, or a coarse particle: crushed glass makes an excellent, inexpensive choice for work on relatively soft surfaces. However, when preparing iron and steel for a protective coating system, there are additional considerations. Coatings adhere poorly to hard, flat surfaces, so the blaster is required to develop a pattern of indentations that the coating can anchor to, aka the anchor pattern. When a sufficiently hard abrasive particle strikes steel, it deforms the surface into a valley and pushes up peaks. The distance between the top of the peak and the bottom of the valley is known as the depth profile. In the U.S., the depth profile is measured by mils – thousandths of an inch. 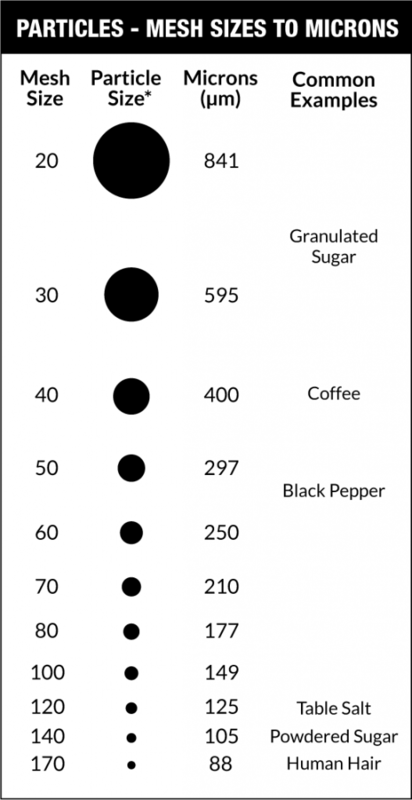 In the metric system, the micron (one millionth of a meter) is used. For optimal adhesion, the applied coating should completely fill the valleys and cover the peaks. The deeper the profile, the more anchoring occurs. However, if the profile is too deep, the peaks can protrude beyond the surface of the coating, causing pinpoint rust and premature failure of the coating. 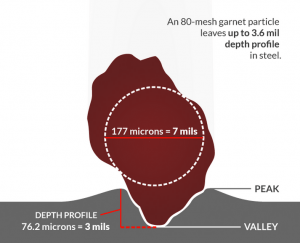 In some cases, the contractor may be required to go back over the area with a finer abrasive to reduce the surface to specified profile depth – a costly mistake. Generally, the correct profile depth will be 25-30% of the dry film thickness of the total coating system. 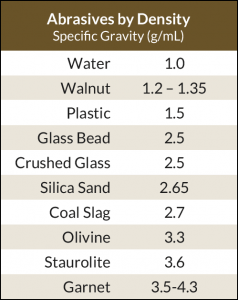 For most industrial coatings, the typical steel profile is between 2-3 mils, not normally exceeding 5 mils. Generally speaking, the harder the particle, the deeper the profile it will impart, except in cases where a high-velocity hard particle shatters, delivering less than optimum force. Softer abrasives, like organic materials and plastics, are good for removing dirt, oil, grease and paint without creating an anchor pattern in the underlying substrate. Is Site Containment Necessary with Vapor Abrasive Blasting? Glass beads are used for general cleaning, peening and cosmetic finishing of sensitive metal surfaces; removing automotive paint; brightening grout and removing fungus and calcium deposits from tile; polishing cast iron, stainless steel, aluminum, propellers and turbine blades. Nut shells and other organic materials don’t cause anchor patterns, making them useful for cleaning dirt, grease, oil, carbon, scale, burrs and paint without changing the underlying substrate. Useful for cleaning auto body panels, electric motors and aircraft engines, dies and molds, polishing watches ad jewelry, and restoring antique surfaces. It comes as no surprise that high speed impacts cause deep profiles. Velocity is the only factor that can be easily adjusted in the field. Once you’ve selected the abrasive that puts you in the ballpark, you can fine-tune the depth profile by adjusting your blast pressure.